There are so many amazing HCP’s on twitter who I interact with or see around, but not that many are blogging. From a purely selfish perspective I want them to as I know they have such a wealth of knowledge to share and I want to learn from them and read it! 1. It highlights to the public and those looking at your social media presence/website what your areas of expertise are and what type of person you are. 2. To share knowledge with others. The internet is saturated with information. Alot of it is wrong! We need the right information to get out there, the more we share it, the more it will be read and come to light. 3. To increase your SEO and visits to your website. It may not be your number 1 priority but it does help when people start searching for you. It also makes your website look like you love it if you frequently update it. I know if I go to a website that has no new content since 2005 I tend to pass by! 4. It gives you a bank of articles you can reuse for clients or make into longer, more detailed articles for publication. 5. It can be good CPD. If you find a topic you need to do some research on, then it could be part of your work-based learning. The world is your oyster as nutriton is such a vast topic. There can almost be too many subject you can cover. I routinely have several blog posts on the go at once. That is sort of how my brain works though! I keep a list on my phone of blog topics, then as an idea comes to me at some odd part of the day, I can just add it in and write the post at a later time. Otherwise when I sit down with the time to write a post I find my brain is empty. Think about your specialist areas, what do you spend most of your time doing? These are the areas to utilise in your blog posts. Write them down and from that list draw out 5 topics you can write about. What questions do clients routinely ask you? What is currently topical, the latest nutriton trend, fad diet, TV cookery show. Sharing your thoughts as a HCP can be so valuable and can highlight you to the media as the person to go to for a quote. Top 5 posts: your top 5 favourite…recipes, cookery book, weight loss tips, nutrition apps, easy snacks to make – you get the idea. What are you cooking in your kitchen at the moment? People LOVE recipes. Anything you research for work purposes can be turned into a blog. Share a bit about YOU. The day in a life of style posts etc.. I love WordPress. It is simple and you can have a blog set up in minutes. It is probably the biggest, most used platform out there. There are so many free and good plug-ins you can use with it to add things to your site. There are tonnes of free templates that will instantly make your blog look good and it takes just minutes to use them. Your big decision now is: A free blog or a self hosted one which you pay a small amount for. A free blog sounds good and is actually where I started out. You will end up with a blog name that ends in wordpress.com. which is not quite as professional. You are also limited with some functionality, limited to what you can upload and in templates and plug-ins. 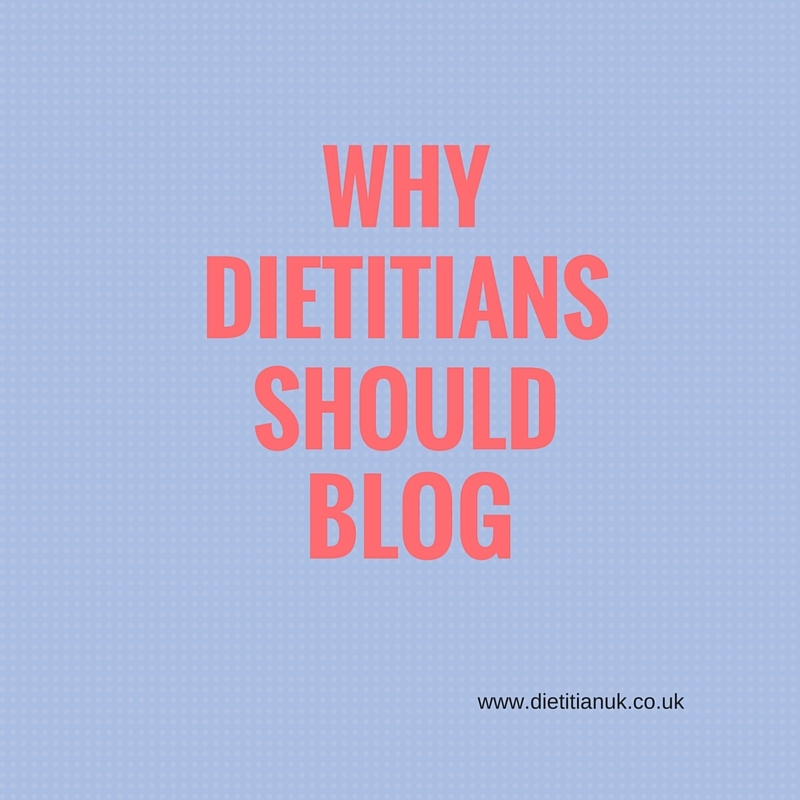 A self-hosted blog is where you buy your domain name (your website name so mine is www.dietitianuk.co.uk) and you buy your hosting (storage space on a site that hosts your website). You can buy a web domain from £1 a year and buy hosting from £2.50 a month. I use Fasthosts but there are many more around. When you have made the decision you can either start a free blog by going to WordPress or buy the domain and hosting then there is usually instructions on how to link to WordPress. Next you choose your template by going to Appearance and Themes. Add a few images and info about yourself and you are ready to blog! 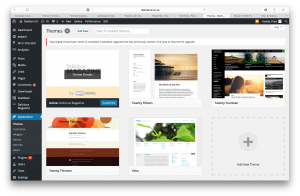 From any part of WordPress you can click the + New button in the top black bar, click Post. You will arrive at the blogging page, now write your title and main article. To add images click Add Media and upload them (non copyright images). Then click Publish on the right hand side. If you link your social media accounts, via Publicise, it will post to all of those for you. I recommend you add a few tags in, these are the keywords that are in your blog post and things that people may search for when looking for it. There is so much more to share to take your blog to the next level. If you are interested in learning more on blogging and social media then please sign up to be told about future articles and resources. 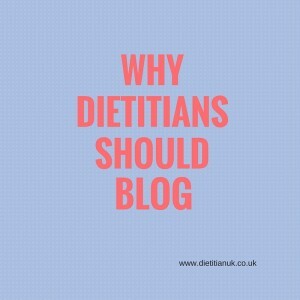 Why dietitian’s need to be blogging. The basics. When I started blogging I had no real idea what I was doing or why I was doing it. I was dabbling and seeing what happened. I had a few friends who were blogging and told me I needed to get on it. So I listened and over the years I have learnt a lot. I’ve done things that have worked, I’ve done a lot of things that really haven’t. So I thought it was about time I shared some of my tips. How hard is it to start a blog? It really is about as easy as setting up your Facebook profile. I love WordPress and started out with a free account with them. There are templates and themes you can choose that will allow you to add some images and then you can go for it and start sharing your knowledge. It is a great platform to use to share knowledge and recipes. I can then direct clients to my blog, send them certain links or I use my own recipes in people’s meal plans. It raises your profile and gives people an idea of who you are and what you do. You can put examples of your work on there. I sometimes put up media work that I have done or a summary of a talk I have given. The public are hungry for knowledge and there is so much incorrect nutrition information out there. We need to counteract this by sharing the right knowledge. Even if you don’t blog you can share other people’s work. I’ve connected with brands, companies and people who I would not have met otherwise. Which can lead to work! You can use some things as CPD. Keep it short. Split a long post into a series. Use pictures or video and label these. When you upload a picture name it as your own. For example I name things in this way: Dietitian UK – banana flapjack 1. Either take your own photos, buy one from an images site or create an image using a website such as Canva. Be aware that you cannot just use a random image off the internet as it may be copyright. Blog about your interests, your specilialism and your passion. Add some of your personality in. Add tags to your blog post, these are for when people search for a certain topic your post will be more likely to pop up. See right down the bottom of the post for my tags. Share, share and share your blog post. Don’t hide it away once your have written it! Try to blog regularly as then people get to know you and follow you. Save your blog posts on your laptop or back up your blog. If you are starting up a blog then do let me know as I would love to take a look at it and share it!